Lovaro made an effort to tone down the flash in its European contest submission. Both the styling and the presentation contain less exaggeration than typical American car portrayals. The original Renault hatchback of the 1960s. 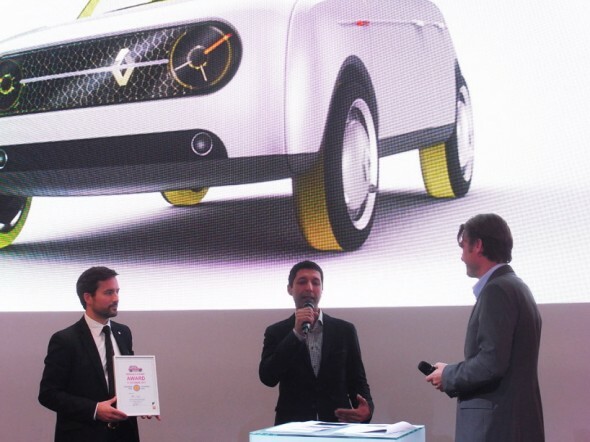 Allen Zadeh and his partner Robert Foote approached the Renault 4EVER challenge as they would a suitcase design. This exercise was intended to free them from conventional automotive thinking. Car culture has accumulated a lot of unwritten design rules. For instance, vehicle forms feel compelled tell us what is under their hood: this car is fast, or this truck is muscular. The exterior must be reflective with a metallic finish and chrome edging. Particularly in the U.S. market, vehicles are careful to stay within a narrow band of emotional expression, between flatly serious to moderately aggressive. 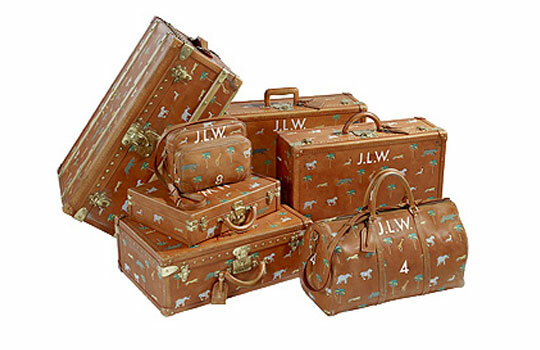 The design of a suitcase, on the other hand, doesn’t carry nearly so much baggage. 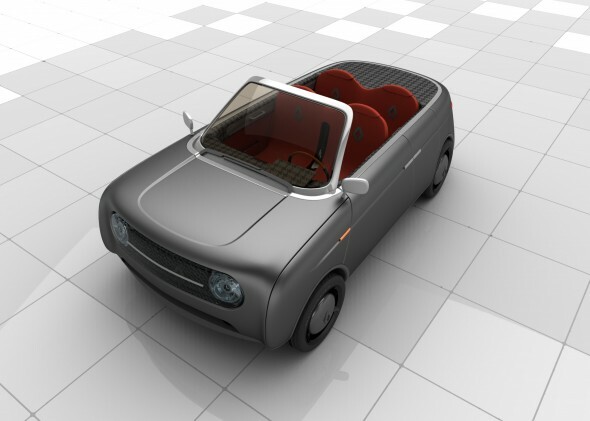 Can a car be designed just like other consumer products? Zadeh and Foote decided to find out. Rendered mute -- Lovaro's winning KeyShot renderings used settings with less reflectivity on surfaces. The result is more emphasis on smaller and more intimate details. Last fall, French automaker Renault gave out three awards in a contest to redesign its iconic hatchback model of the 1960s, the Renault 4. Lovaro was the only American team recognized out of 3000 entries worldwide. Traveling companions -- Like cars, suitcases travel with you. Lovaro argues that the same emotional bond owners have with personal items can be applied in the automotive realm. Its award-winning submission is called the Eleve, meaning “student” in French. 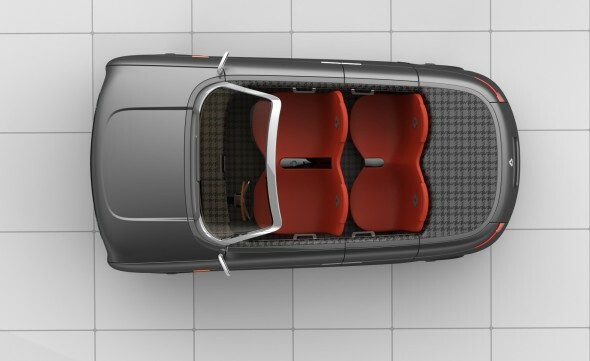 While it borrows on the form of the original Renault 4, it advances several progressive ideas like a removable roof, interchangeable components, recycled materials, and an interior concept that has more common with furniture showrooms than car dealerships. To the kids in Brooklyn, style and personality trumps the tradition selling points of speed and horsepower. Rather than feeling materially competitive, they seek experiences that enhance their social network. The generation that grew up with design and technology has developed a strong aesthetic sense of intrinsic value. A software app gains popularity not due to advertising hype but by the simple fact it’s not frustrating to use. As it smoothly executes even the smallest task, it gives an impression of friendliness. U.S. car culture still relies on an older, industrial-age marketing formula. Glamor is an external additive to the product, which has more to do with re-engineering our belief systems. Rather than simply selling the product because it integrates well with our everyday reality, glamor tries to sell us a fantasy version of ourselves: You are the type of person that belongs in car x.
Lovaro is not normally in the automotive realm, but the firm prides itself in working across industry lines to find straightforward solutions that embody an honest attitude. The simplest expression of the intrinsic value of a product is generally a successful formulation of the design challenge, regardless of industry, according to Zadeh. 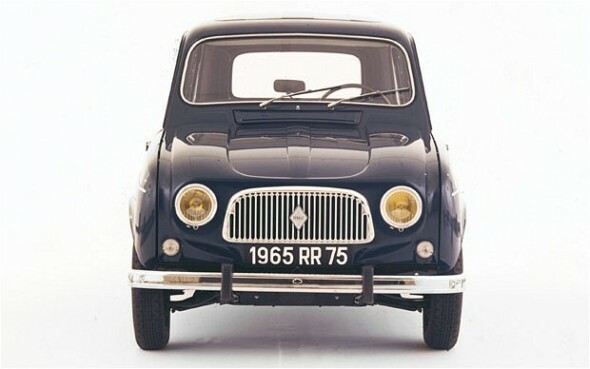 The early Renault 4 helped establish a more practical car sensibility in Europe. The roots of American car culture grew from the 1950s and 60s, when the industry was surging with confidence. At the same time, France was still rebuilding its infrastructure of its postwar economy. 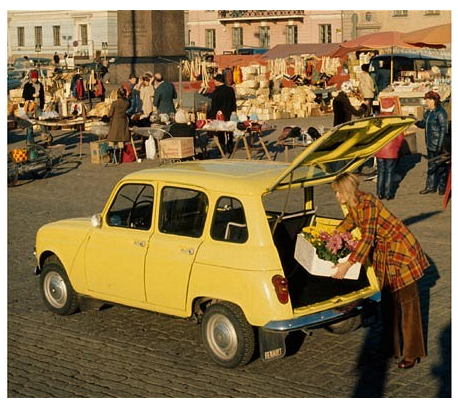 The roomy, reliable, and utilitarian Renault 4 was the one car in reach for many French families emerging from a decade of recession and inflation. Along with the VW Beetle and Citroen 2cv, the best-selling model would define European passenger car design for the decades to come. In the context of the times and culture, the original hatchback’s expression was not aggressive or flashy, but cute and dignified. To this day, Europeans don’t dramatize and overstate the meaning of the automobile to the extent of Americans. Rather than symbols of status, cars are treated more like extended members of the family. 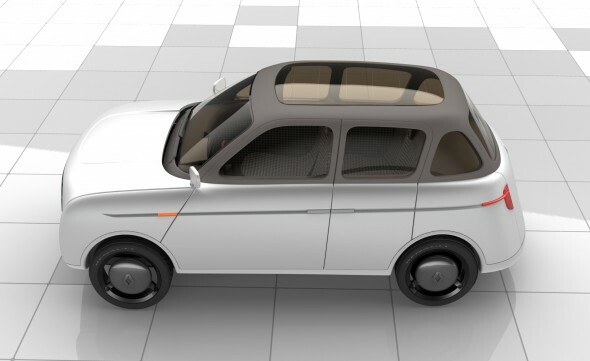 The recent design contest on the occasion of the Renault 4’s 50th anniversary gave Lovaro the opportunity to borrow a few notes from both car cultures, in an attempt to strike an emotional chord. An understated approach is seen in even the small considerations for the Eleve, right down to its finish: It doesn’t have one. Lovaro was careful to tone down the veneer in the presentation of the design as well. The submission illustrations were rendered in KeyShot, a CGI application that gives computer-design models the professional cosmetics of car ad photography. In this case, Zadeh kept its KeyShot output intentionally low-key. Unlike typical car ad depictions, sensually lit body surfacing is not the center of attention in the Eleve visuals. Instead, smaller features jump out. A faint blue emissive material inside the LED headlamps gives the car a clever blue-eyed gleam. 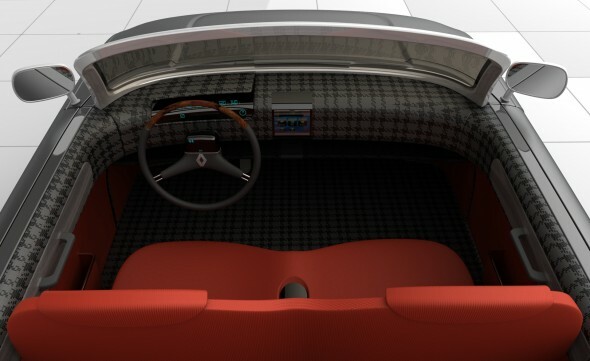 With the car’s detachable roof off, viewers are drawn towards the interior features. Like a suitcase, the Eleve is an object best appreciated close up, rather than from a distance. Zadeh and Foote accepting the award in Paris. Whether a true commercial revival of the “4” is forthcoming from Renault remains to be seen, but designers at Lovaro see a window opening for alternative thinking in automotive concepts. Zadeh believes that by toning down the prevailing over-dramatized design aesthetic, one can communicate on levels that are more personal and lasting. By refusing to rely on rote expectations and commercial hyperbole, the industry can turn towards finding new intrinsic values that directly relate to today’s consumers. “As a designer, you have to ask how does the product represent the sort of attributes that people really care about when using it — not just qualities that have been idealized over time by producers and other designers. If you look at a problem carefully you can both draw new inspiration and connect to people in a right way,” says Zadeh. A version of this article was published in Desktop Engineering. Look in any souvenir shop at Heathrow airport, and among the dangling key chains of Big Ben and palace guards, you’ll also find miniature, antique-looking black cars. After 50 years, the stately hackney carriage, otherwise known as the London Cab, has become a sort of landmark on wheels — an internationally recognized symbol of the city’s identity. It may be surprising to learn that London is the only major city to have a vehicle especially built as a taxi. In all other places, a cab is not much more than a sedan with a paint job and a meter bolted to the dash. 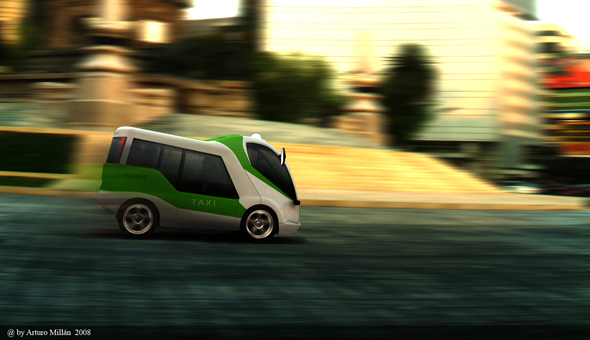 But soon London won’t be the only city with a distinctive taxi of its own. The government of Mexico City recently selected a winning design from 76 submissions. The Chapulín, meaning grasshopper, will undoubtedly become a new icon for visitors, and an attractive option for residents to get around town. 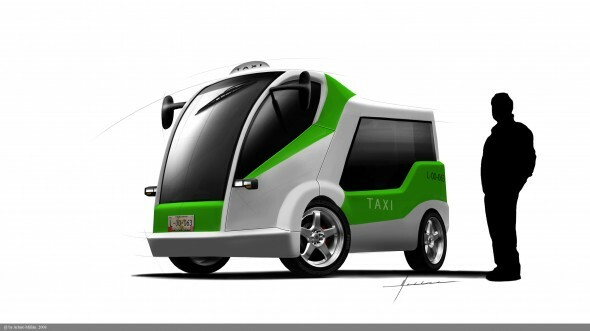 In fact, the new taxi forms the building block for a public transportation program of enormous magnitude. The city’s plan will eventually call for 120,000 taxis – six times the number of cabs now on the streets of London. The concept of the Chapulín comes from a Mexico City transportation design school, Rigoletti Casa de Diseño (RCD). The team consists of recent graduate Eduardo González Morón, instructor Arturo Millán Martinez, and Juan Antonio Islas Muñoz, RCD’s academic coordinator and also an alumnus. RCD is starting to make winning design contests a bit of habit, with students and teachers claiming top spots in the Peugeot Design Contest over the last few years. 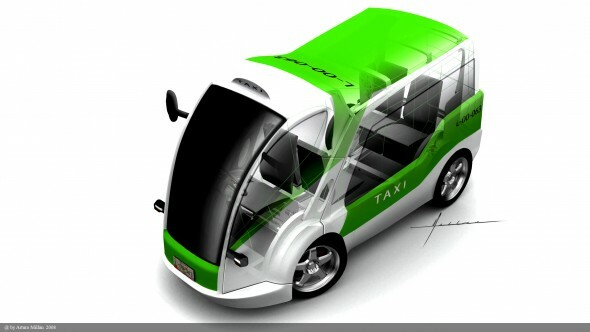 As for the taxi competition, the online call for entries gave designers nearly two months to submit a concept. 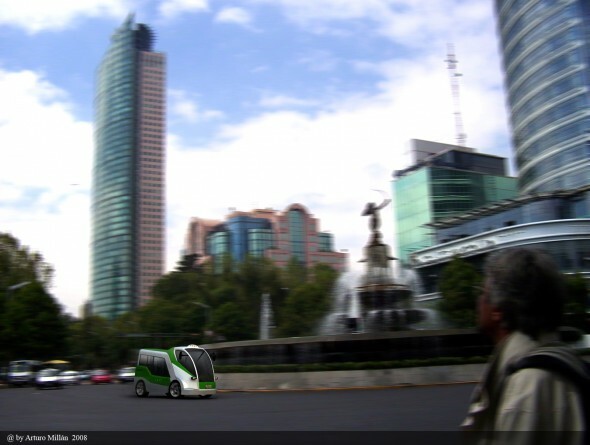 But two weeks was enough time to reconsider the most common notions of a taxi, evaluate Mexico City’s intense transportation needs, and put forth an answer in one compact, innovative, and environmentally responsible design. The experience of taking a cab is akin to staying at a hotel. Better hotels strive to accommodate their guests, making them feel more secure and comfortable away from home. In the case of most taxis across the world, it’s the other way around: passengers have to adjust to the vehicle. These are just a few of the problems of use ignored in the basic car-to-cab conversion. The experience of hailing a Chapulín is different, most notably when you step inside. The Chapulín does away with the trunk entirely, leaving more floor space for an extra-tall cabin. Wide doors open up to a circular seating arrangement for four. You sit with your luggage, which not only keeps it safe, but also allows for quicker pick-ups and drop-offs. For handicapped patrons, a ramp extends to the curb for wheelchairs, which can be easily secured to a rail on the floor during the ride. 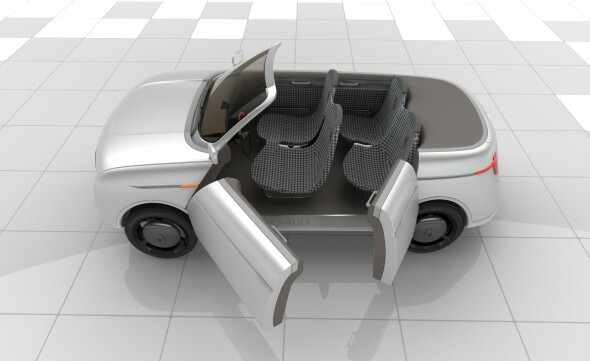 Passenger seats flip up to make more room for wheelchairs or larger pieces of luggage. 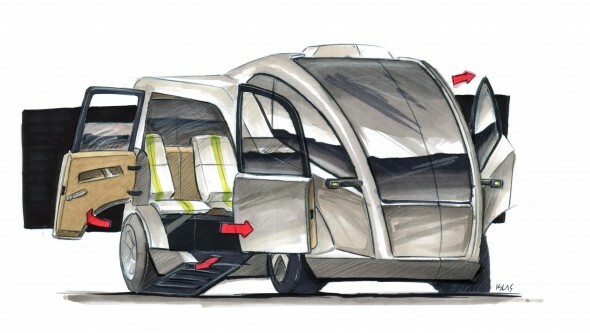 In addition, the taxi divides the driver and passenger areas for the safety of both. Islas and his team also drew from their own experience navigating Mexico City, the largest metropolis in the Western Hemisphere. The metro area of the capitol teems with nearly 20 million inhabitants, a greater population than Tokyo. While Tokyo’s development has built upward into tight densities, Mexico City has spread outward through a long reliance on highways. Getting more cars off the road may be one of the positive effects of Mexico City taxi program, by providing an attractive alternative for residents who would normally own a vehicle. But the mini-compact size of the vehicle frees up some space all by itself. The Chapulín is only 3.65 meters long, shorter than a Ford Fiesta. Because it is least a meter shorter than normal cabs, trading out all the current taxis for the new version would clear more than 12 kilometers of city street. Due to the huge number of cars, Mexico City ranks first in the world’s smoggiest cities. The government has already adopted drastic measures to reduce congestion and pollution, including Hoy No Circula, where cars are grounded one day a week according to license number. 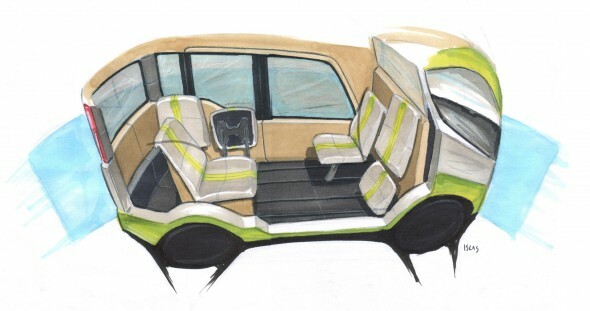 “We thought in addition to the contest’s requirements of good handling in difficult mobility zones and accommodation to passengers, that sustainability – both economically and environmentally — was of the utmost importance,” says Islas. How did the RCD team prepare all these ideas for city officials in just two weeks? The approach involved communication of the essential concepts – the styling and features – without getting too detailed. The team printed screenshots of the 3D model and sketched over them by hand, rather than creating full renderings. This gave a loose expression of the interior features and saved time in the rush for submission. After the award, the city now owns the rights to the design. Islas expects that the city will hire them to do further design development as the project goes into engineering and production stages. Like the hackney carriage, the Mexico City mini-cab has a distinctive design that has a potential to become a mobile mascot, a symbol of the city that could last for decades. The government plans to make two or three prototypes of the Chapulín and perform test-runs. After that, it intends to produce 12,000 cabs a year, until the goal of 120,000 taxis citywide is reached. So very soon, not only will you find a comfortable ride to catch your flight at MEX, but once you get there, you also might find little “Chapulínes” dangling in the gift shops. # # # A version of this story appeared in the design magazine Develop3D. Rigoletti Casa de Diseño is a design center dedicated to promote industrial design with an accent on Latin American and Mexican styles. RCD carries the only Bachelor Degree in Transportation Design in Latin America, in alliance with the IAAD (Instituto d’Arte Applicata e Design, Torino), and certified by EABHES (European Accreditation Board of Higher Education Schools). The main goal of RCD is to create internationally competitive designers. Past students have won internships to Alfa Romeo, Fiat, and Nissan. Besides the academic mission, RCD also carries industrial and transportation design projects commissioned by clients. For more information please visit: www.rigolettidi.com. Rhinoceros provides the tools to accurately model your designs ready for rendering, animation, drafting, engineering, analysis, and manufacturing. Rhino can create, edit, analyze, and translate NURBS curves, surfaces, and solids in Windows, without limits on complexity, degree, or size. Rhino gives the accuracy needed to design, prototype, and engineer, analyze, and manufacture anything from an airplane to jewelry. To see the many diverse products designed with this affordable 3D tool, and to download a free evaluation version, please visit: www.rhino3D.com. The Diametroid DT-CVT: An inside look in the new transmission concept by Australian inventor John Bisby. John Bisby was simply looking for an easier ride home. On the way, he found himself entangled in a geometric problem that has puzzled mechanical thinkers since Leonardo da Vinci. The improbable difference this time: it looks as if Bisby may have come up with a new path to the solution. The story begins when the 48-year-old automotive electronics technician wanted to modify his bicycle with an electric motor to assist in the steep climbs near his home in Jordan. Having had some experience converting cars to electric vehicles in his native Australia, Bisby thought he could do it himself, but soon ran into a conspicuous gap in available technology. Most electric assists make do by using the middle gear on the existing transmission and adding an electrical speed controller to the motor. This did not satisfy Bisby. He wondered, why the motor couldn’t output a constant rate – what an electric motor does best — and have mechanics transmit that power to gradually turn the rear wheel to higher and higher rotations? That seemingly simple question de-railed Bisby from world of practicalities and plunged him into theory. For 18 months, the idea that the input and output of a transmission could interact within a single dynamic system consumed Bisby. “It’s not as if I was trying to break any laws of physics, so I kept at it,” he says. Thinking about the puzzle kept him up at night. New insights into the calculus came to him during long walks in the woods. He spent several more months writing out the explanations and equations of his solution for a new type of continuously variable transmission (CVT). He applied for a UK patent on his invention, the Diametroid, or what Bisby labels more generally as a DT-CVT. Input and Output: The device is designed to receive a constant rotational speed of input, which continuously varying the speed of rotational output. Once in operation, the device balances this ratio dynamically, and needs no manual or mechanical regulation to affect acceleration. 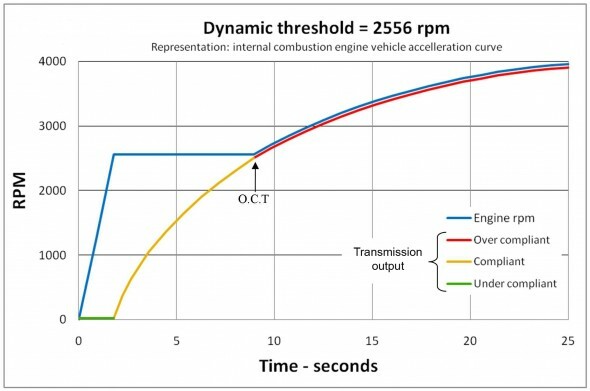 “In his research, my patent attorney could find nothing similar to the Diametroid,” says Bisby, who dubs the DT-CVT as the “holy grail of power transmissions.” By all appearances, the mechanics of Diametroid approaches the problem in a fundamentally different way than contemporary CVT designs. By his own admission, Bisby is not a transmissions expert, but the title might be fitting if the Diametroid proves to have viable commercial advantages. Bisby claims that they are all there: a smoother acceleration and a more compact size; less wear on engines and its own components; and perhaps most striking — a negligible loss in efficiency. Transmissions most common in everyday life – our stick shifts and ten-speeds — operate on fixed ratios set by gears and controlled by clutches or derailleurs. A shift in gears moves to rotational force onto a circle of wider or smaller radius, accompanied with the familiar lurch in acceleration or sag when downshifting that jerks the heads of drivers and passengers. A continuously variable system, on the other hand, provides for a stepless acceleration. It gives not five or so intervals of fixed ratios, but an infinite number in between. The simplest form of a CVT utilizes a belt between two rotating pulleys. Instead of 2D discs, the pulleys are actually cones. A hydraulic regulator shifts the position of the cones perpendicular to the belt. The belt slips down and up the cones to a wide range of radii, smoothly varying the ratios between engine and wheel. “Other CVT designs share a common characteristic,” explains Bisby. “The input-output ratio of the transmission changes by varying the effective diameter of one or more components.” Later variations of the CVT replace the spinning cones with some other 3D shapes to produce a similar variance. Bisby’s Diametroid, however, does not employ this technique, instead relying solely on planetary gearing. Since our conventional transmission is full of clunky shifts, each of which works engines harder and leaks efficiency, one might question why we have the transmission we have now, instead of a CVT. One can only look back at the oddly sporadic evolution of the CVT and speculate. Da Vinci sketched his version of a CVT back in 1490, way back before there were cars or bicycles to make use of it. Four centuries would pass before a CVT device would be patented. Only in the last few decades have CVTs achieved some a commercial popularity. Small CVTs are found in a wide range of power tools, tractors, and snowmobiles. More complex – and much bulkier — CVTs have been adapted in the automotive world by a few companies looking to boost efficiency. Automotive CVTs earned public scorn when mated with lower-performing engines as with the Subaru Justy or the Ford Fiesta 1.1 CTX, but found more enthusiasm in more muscular offerings by the European carmakers DAF and Audi. There are big differences between Bibsy’s concept and current CVT designs. First, as mentioned, the Diametroid is a compact box of orbitals and gearing, and does not rely on a big spinning solid to vary diameters (which makes current CVTs bulky) nor anything like a friction driven belt (which is liable to wear out and break). There are no variable elements at all in the Diametroid. Unlike the pulley-driven CVT example, the Diametroid needs no hydraulic or other powered mechanism to regulate the ratio of rotational velocities. The dynamic threshold is the “DT” in DT-CVT. It is the point where the power input reaches an established RPM rate. Once reached, the dynamic system kicks in. The output RPM then increases continuously from zero to its maximum rate, while the input remains always at the same RPM. Once within this dynamic system, more torque (at the same rotational speed) translates directly to output acceleration. Bisby's Rhinoceros model of a hypothetic bicycle application of his dynamic threshold CVT, one of many vehicular applications on display at his website www.diametroid.com. In this scenario, the bike transfers power through a drive shaft rather than a chain to the transmission attached to the rear hub. In far right, an added motor for an electric-assist bike. For sake of example, apply a small version of the transmission to a hypothetical pedal-powered bike. The rider would give the bike a push off and start peddling; no power will be transferred to the back wheel in the first few seconds. But once the feet pedal at the prescribed dynamic threshold, for this example, say, a typical cadence of 66 revolutions per minute, the bike begins to smoothly accelerate. “If you’re peddling along at 66 rpm, it does not matter how much force you put on the pedals, they will always spin at 66 rpm,” explains Bisby. “If you try and pedal faster, it will simply translate the power to the back wheel as more torque.” Balancing on this dynamic system, the rider needs no manual controls or outside regulating devices. But it’s when an engine replaces leg muscles that the full potential of the Diametroid is seen. Internal combustion engines are happy to run at a constant rate. Revving from low to high RPMs creates wear on the engine. This is even truer said for electric motors, which drain heavily on battery power in order to get up to speed. By design, electric motors operate at a maximum efficiency when they run at one constant rate of output. 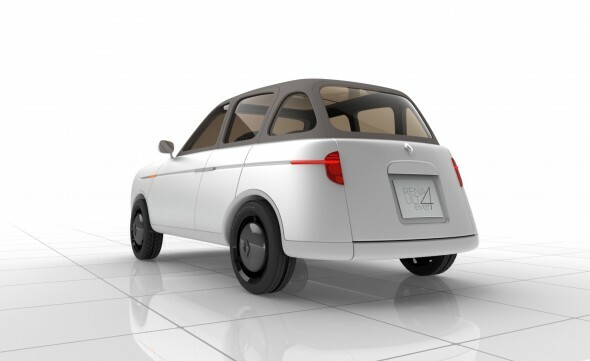 Any discussion of the next generation of fuel-efficient personal transportation seems to revolve around the prospect of electric motors, or at least some hybrid combination. Not only does the Diametroid seem to answer this call because of its easy mating with electric motors, but also because the transmission itself is extremely efficient. Bisby says conventional automotive torque converters are relatively inefficient. Both stick-shift and automatic transmissions increase in friction while increasing rpm, while the Diametroid does exactly the opposite, approaching 100 percent efficiency at top speed. For the mechanically and mathematically inclined, a detailed technical explanation of Bisby’s invention can be found at his website, www.diametroid.com. In the 3D surface modeler Rhinoceros, Bisby has created a virtual prototype that simulates the rotational motion. 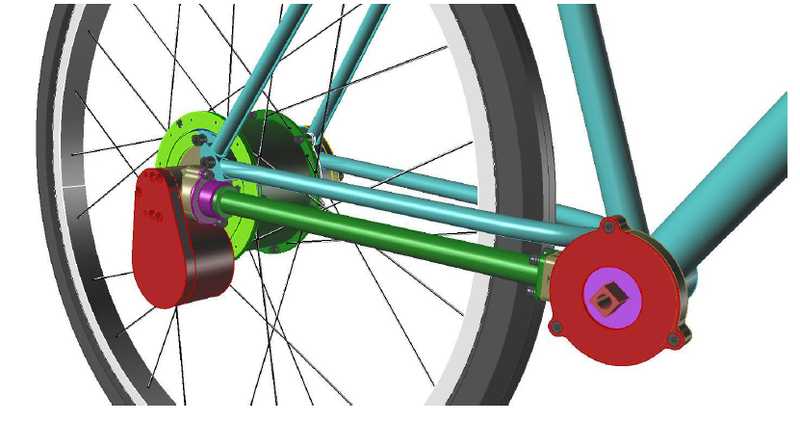 The site shows several exploded assemblies of the 3D model as well as a few hypothetical auto and bicycle application examples employing the Diametroid. One mechanically inclined person who has reviewed Bisby’s materials is automotive engineer Pablo Serrano, who performed calculations for the original Variometric CVT on the 1985 SDL and TDL models from DAF, and has also worked on a more updated CVT concept for the Danish automaker last year. One of the appealing features for Serrano is the size and simplicity of the device. “It has less mobile pieces than current CVTs,” he says, explaining that Audi’s first-generation multitronic CVTs were about the same size as the engines. A DT-CVT would very likely be more compact. Bisby confidently disagrees on the issues of high RPM and torque. “Power transfer operates through a dynamic process which is completely immune to power levels,” he says. He also points out that the internal components spin much slower than a conventional automotive transmission, typically a maximum of 850 RPM, reducing to near zero RPM at vehicle top speed. Also, unlike current CVTs, the transmission is not required to attach to a stable structure to brace against high levels of torque. This feature is visible in the Diametroid bicycle adaptation that Bisby modeled in Rhino. The device attaches to the wheel itself, without any torque connection to the frame. Bisby is sure that the concept can be scaled for nearly any power or torque application – conceivably even to a Formula One racecar, running at 20,000 RPM. And perhaps after his theory becomes a bit closer to reality, Bisby can get to work on putting that motor on his bike. For more information and more models of the DT-CVT, please visit: www.diametroid.com. Rhinoceros provides the tools to accurately model your designs ready for rendering, animation, drafting, engineering, analysis, and manufacturing. Rhino can create, edit, analyze, and translate NURBS curves, surfaces, and solids in Windows, without limits on complexity, degree, or size. Rhino gives the accuracy needed to design, prototype, engineer, analyze, and manufacture anything from an airplane to jewelry. To see the many diverse products designed with this affordable 3D tool, and to download a free evaluation version, please visit: www.rhino3D.com.